In combination with properly worn seat belts, the head restraints offer effective protection. However, they must always be properly adjusted to suit the height of the occupant. – Take hold of the sides of the head restraint with both hands. – Push the head restraint upwards. – Take hold of the sides of the head restraint. – Press button A ⇒ fig. 79 and push the head restraint downwards. For best protection, the top of the head restraint should be at least at eye level, or higher. The height of the head restraints is adjustable. They should be set to suit the height of the occupant. In combination with the seat belts, the head restraints offer effective protection, provided they are properly adjusted. 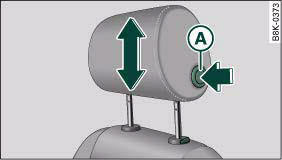 – Push the head restraint upwards as far as it will go. – Press the button A ⇒ fig. 80 and push the head restraint downwards. 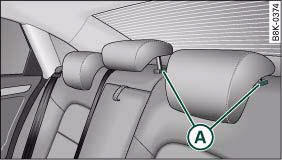 When the rear seats are not occupied the head restraints should be moved to the lowest position so that they do not obstruct the driver's field of vision.